A Near Death Experience for the Death Penalty? 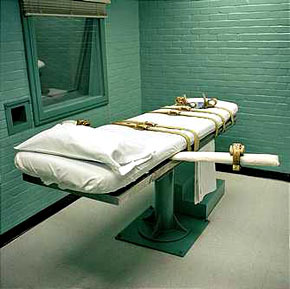 The sole American manufacturer of an anesthetic widely used in lethal injections said Friday that it would no longer produce the drug, a move likely to delay more executions and force states to adopt new drug combinations….No other American companies manufacture the drug, which has largely been supplanted by alternatives in hospitals but is used by 34 of the 35 states that use lethal injection to carry out the death penalty….During what had been described as a temporary halt to production last year, scarcity of sodium thiopental led to delays in scheduled executions in at least two states, California and Oklahoma. I oppose the death penalty on pragmatic grounds (it’s too expensive) and moral grounds (it’s pretty obvious that we aren’t able to apply it fairly), but it’s never been a huge hot button for me because I’ve never thought that it’s inherently barbaric or wrong. That said, some of the best evidence that most of us feel pretty queasy about the whole thing is the idiocy of lethal injections. Frankly, if the whole process is so unbearable that hangings and electric chairs and firing squads and gas chambers are all beyond the pale, then maybe it really is inherently barbaric. And if that’s the case, we shouldn’t kid ourselves that recreating a sterile hospital environment makes it any less so. Besides, it’s still the case that putting someone to death is a mind-bogglingly expensive and convoluted process; we plainly aren’t able to apply it fairly; and alone among punishments it’s impossible to reverse if and when a mistake is discovered. That’s reason enough to end the practice, and hopefully the end of sodium thiopental will prompt at least a few states to bring an end to the death penalty too.